An exceptional and unique adventure in the heart of the Etang Salé forest "
Reunion Island is An exceptional symbiosis between precious elements and heritage. Your perfect day An exceptional symbiosis between precious elements and heritage. 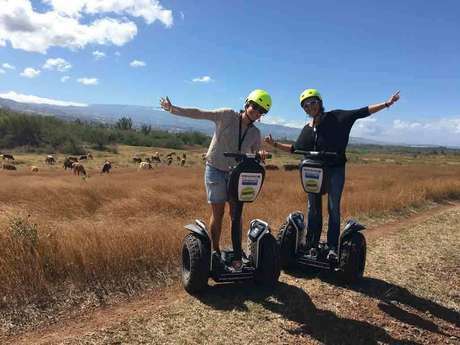 I tested one of the most unusual activities available on Reunion Island: an all-terrain Segway ride in the magnificent Etang-Salé forest, right to the edge of the sea. Do you know about Segways? You stand on this two-wheeled electrical scooter, also known as a gyropod, that you steer by tilting your body. 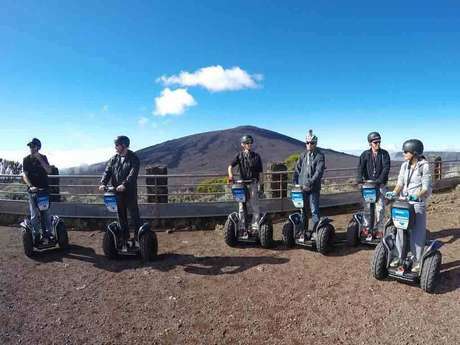 It's the ideal way to discover Reunion Island's landscapes, because these Segways have all-terrain tyres which means they nimbly get over all the small obstacles on the paths. This afternoon, Fred, our guide, is waiting for us in the Etang-Salé forest. A short induction is all we need to learn the rudiments of steering. 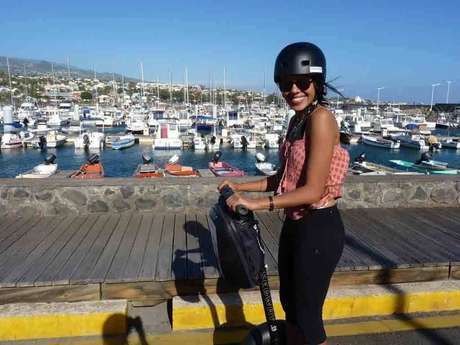 It only takes 15 minutes for us to know everything there is to know about the Segway. Manoeuvrable, quick, powerful and effortless: what a great invention! We set off to the explore this thousand hectare forest, created in the 19th century on the lower slopes of the south-west of the island. Under our helmets, we listen to Fred on the headsets: he tells us all about the local history, and the vegetation, which is typical of dry areas. I sometimes get carried away by the speed on the sandy tracks, but there is so much to discover along the way that we make more and more stops. "Bois de senteurs" and red latanier palms are endemic plants of Reunion Island, which existed well before man arrived. They were joined by numerous species from other tropical regions: flamboyant bright red flowering plants and with the southern summer come the filaos, the Indian tamarind. The time passes too quickly, the end of the afternoon approaches and soon we reach the sea. An endless black sandy beach, caused by the volcano, opens up before us. When we booked, we chose the option "Collation Pei". Under the coconut palms, a table has been set by Monira. Fruit juice, samosas and other Creole delicacies await us. Here we watch the stunning sunset, as the light of dusk paints Reunion Island in beautiful colours. We raise our glasses to this exceptional day.